Hot Issue in Cold Environment! How can it serve Climate? Should climatology explain the Arctic warming since winter 1918/19? It is the most pronounced single climatic event since the volcanic Krakatoa eruption, the sudden extreme temperature rise in the Arctic region for two decades since winter 1918/19. Suddenly the temperatures literally exploded. 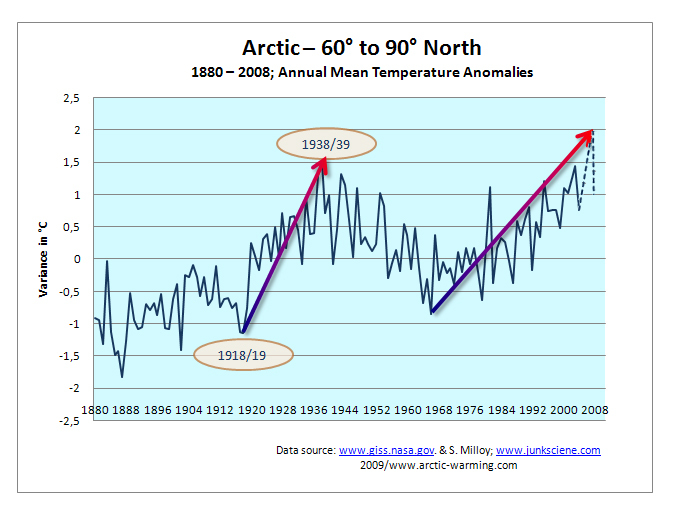 The extraordinary event from 1918 to 1939 is clearly demonstrated in the graph showing the ‘Arctic Annual Mean Temperature Anomalies 1880 – 2008’. Meanwhile almost a full century has passed, and what do we know about this event today? Very little! Scientific literature is quite superficial concerning all three questions: Where? When? Why? That is deplorable and hardly convincing when listing to the climate change debate and all the academic discussion on predicting future climate conditions. Climatology should be required very decisively to explain the arctic warming since 1918 comprehensively and very soon. That this is by far not an impossible undertaking is thoroughly demonstrated and discussed on this site, which is fully committed to the arctic warming event that started in winter 1918/19, which corresponds to about 40 text pages plus graphs. One century has passed since arctic warming started, and IPCC seems unable and unwilling to get even the most basic facts right. The following investigation tries to offer clues and explanations what actually happened in the Arctic realm at the end of the 1910s and what may have caused the arctic warming at the beginning of the last century. Three issues are hotly debated worldwide: Climate Change, Global Warming, and Anthropogenic Forcing. Understanding the Arctic warming in the early last Century would significantly contribute to a more fruitful discussion of each of these subjects. The fact is that the winter temperatures made a jump of more than eight degrees Celsius at the gate of the Arctic Basin, after 1918. Nowadays, one century later, the event is still regarded as “one of the most puzzling climate anomalies of the 20 th century”.This shows that there hasn’t been any convincing progress on understanding the climatic change issue! The first to wonder about this subject was the Norwegian scientist B.J. Birkeland who stressed in his findings, back in 1930, that it could “probably be the greatest yet known on earth” (see Table of Temperatures at Annex I). Although this extreme warming event is known for many decades, the Intergovernmental Panel on Climate Change (IPCC) mentioned recently that the “average Arctic temperatures increased at almost twice the global average rate in the past 100 years”, and that this represents a very significant part of the global warming issue. That is of little help if not a straight disservice to the climate debate. 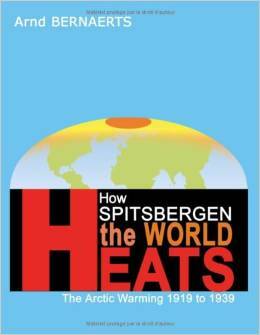 What need to be acknowledged is that the ‘hot issue’ was measured in the winter of 1918/19 on the remote Norwegian island of Spitsbergen, just 1,000 kilometres away from the North Pole. Spitsbergen experienced an increase of winter temperatures of more than 8º Celsius within only a few years. When the event started, the actual figure was particularly high (see: graph), and spread out far beyond the local region over a short period of time. WHERE: the warming was caused and sustained by the northern part of the Nordic Sea in the sea area of West Spitsbergen the pass way of the Spitsbergen Current. WHEN: The date of the commencement of warming can be established with high precision of few months, and which was defiantly in place by January 1919. WHY: the sudden and significant temperature deviation around the winter of 1918/19 was with considerable probability caused, at least partly, by a devastating naval war which took place around the Great Britain, between 1914 and 1918. The “Big Warming” event from Spitsbergen proves that the climate change was not determined by the atmosphere; but first of all, if not alone by the sea. If climate were defined as ‘the continuation of the oceans by other means’ , the arctic warming would –with high certainty- have been fully understood and explained since long, and thus could have provided a big service to the general climatic change debate. I.V.Polyakov, et.al. ; Variability of the Intermediate Atlantic Water of the Arctic Ocean over the last 100 Years, Journal of Climate, Vol.17, No.23, 2004. B.J. Birkeland , Temperaturvariationen auf Spitzbergen, Meteorologische Zeitschrift, June 1930, p. 234-236. IPCC; Op. cit. (Fn 6). See: Bengtsson et.al; Op. cit. (FN 3). A number of papers by Arnd Bernaerts since 1992 suggest to use this term; see: www.oceanclimate.de.